The answers to one of Neilsen's ongoing surveys of mobile shoppers in the US are very helpful to small businesses: Shoppers feel most secure making purchases at brick-and-mortar stores, and very insecure about buying products on their smartphone. But they much prefer the convenience of online shopping over shopping at a retail store. How can you use this data to help your business? Even in 2012, only 22 percent of respondents stated that they felt that online shopping was the safest, even though there is just as much likelihood that your credit or debit card can be used for fraudulent purposes at a retail location as there is of your data being hacked or stolen by an online fraudster. The three times I personally have been a victim of fraud, each incident happened at either a retail store or a gas station and involved my debit card being copied. Media reports of retail giants being hacked don't make consumers feel any more secure, but there's nothing you can do about that. You can look at security certificates for your website that assure the customer that you are doing everything you can to protect their data. McAfee's Web Security Seal is one of the more recognizable and trusted brand names, but there are many more out there. McAfee will ensure that your protocols meet the rules for PCI (Payment Card Industry) compliance for credit-card acceptance, and it will continuously scan your website for vulnerabilities. 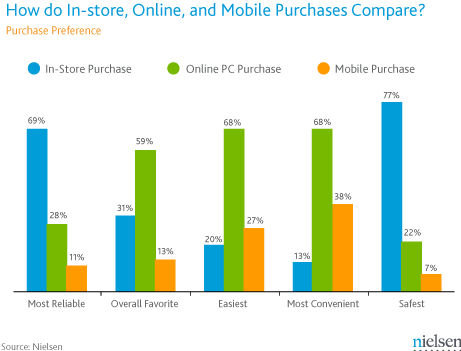 Nielsen survey: People love online shopping, but they don't like to shop using their smartphones. Yes, this seems counterintuitive--until you consider Nielsen’s finding that just 13 percent of Americans find in-person shopping “most convenient.” A web store doesn’t cost a mint to set up, and there are interesting options--such as selling your goods on Facebook. If your products are good enough for your community, think how much more you'll sell if you throw open your doors to the world. Contact your local web designer for a quote. Costs will vary depending on the functionality you're looking for and the number of SKUs you'll be dealing with. Check with your point-of-sale software provider as well. A package such as LightSpeed ($1,597 per license, including an iPad barcode scanner) can take all of your entered SKUs and upload them to a web store. For now, your company's mobile presence should be about branding and getting foot traffic to your brick-and-mortar store. If Nielsen’s data is correct, American shoppers consider mobile shopping to be only slightly more convenient than visiting an actual store. While the technology behind website security seals should theoretically work on your smartphone in the same way it does on your computer, consumers obviously trust their phones less. Shoppers still want to go to stores in their local towns, but they like the convenience of online shopping. If you’re a merchant, the best way to capitalize on this sentiment is to offer your products on sale online. Angela West will shop no matter what obstacles you put in front of her. Copywriter by day, she specializes in making website copy interesting instead of an annoying slog that makes you want to do the opposite of whip out a credit card. Follow her on Twitter at @angelawest or check out her Facebook page for a compilation of all of her PCWorld Business Center posts.